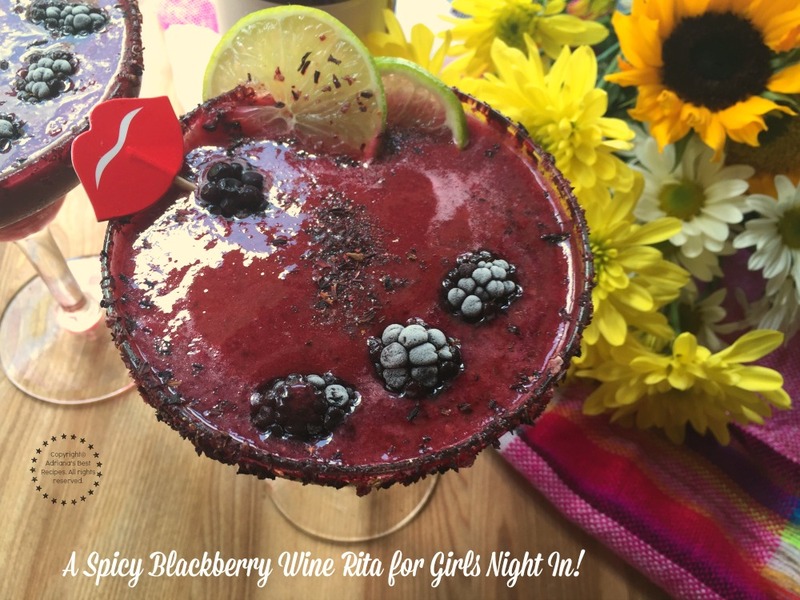 Spicy Blackberry Wine Rita for Girls Nigh In! I like to organize girls night in and serving special cocktails. That is why I am suggesting to prepare a Spicy Blackberry Wine Rita. 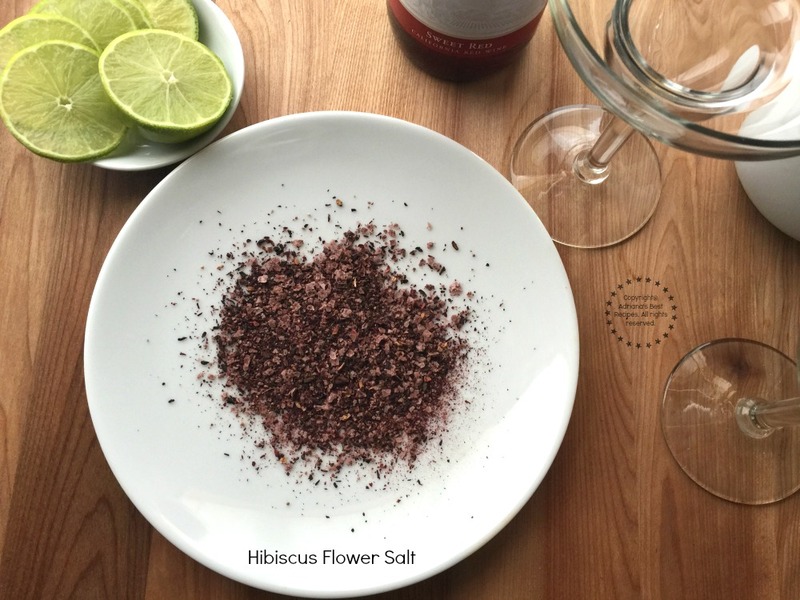 This cocktail is made with frozen store bought margarita mix, blackberries, green habanero sauce, tequila blanco, hibiscus salt and Sutter Home Sweet Red Wine. 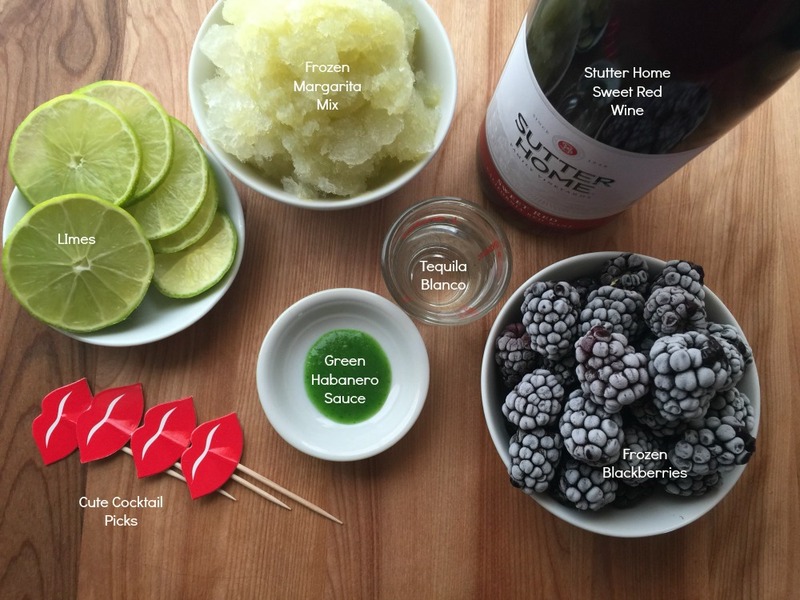 The combination of sweet and sour goes perfect with the Sutter Home Sweet Red Wine, a delicious pairing for entertaining at home this summer and get ready to uncork the moments. Making craft cocktails at home, like this Spicy Blackberry Wine Rita is a creative way to bring alive a classic margarita recipe with a twist. 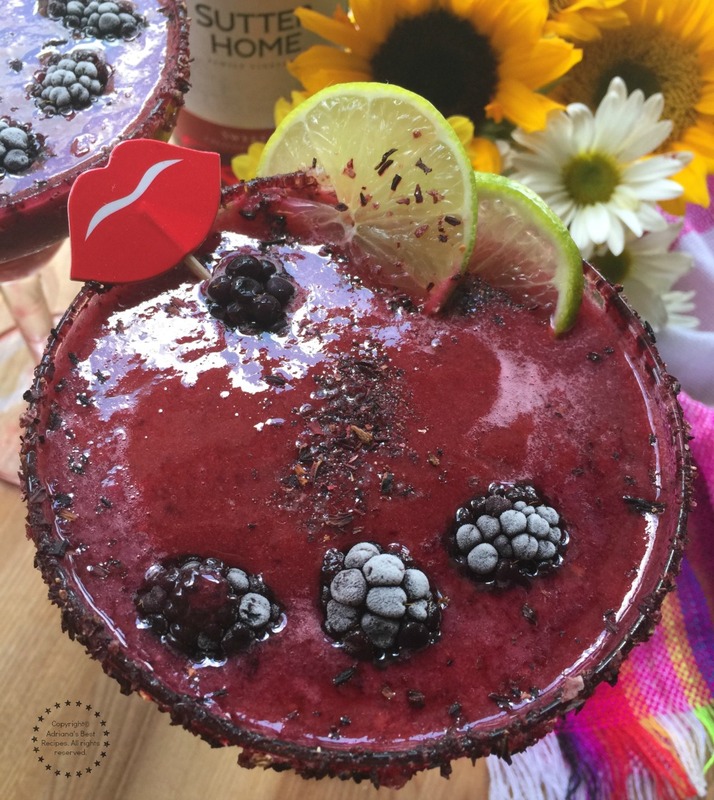 This Spicy Blackberry Wine Rita made with frozen store bought margarita mix, blackberries, green habanero sauce, tequila blanco, hibiscus salt and Sutter Home Sweet Red Wine. Place all ingredients in the blender, the margarita mix, the blackberries, the tequila and the habanero sauce. Blend until getting a smooth icy sauce. Salt the rim of the margarita glass rubbing it with the lime first and then dust with the salt. Scoop 3 tablespoons of the spicy blackberry mix and add to the margarita glass. 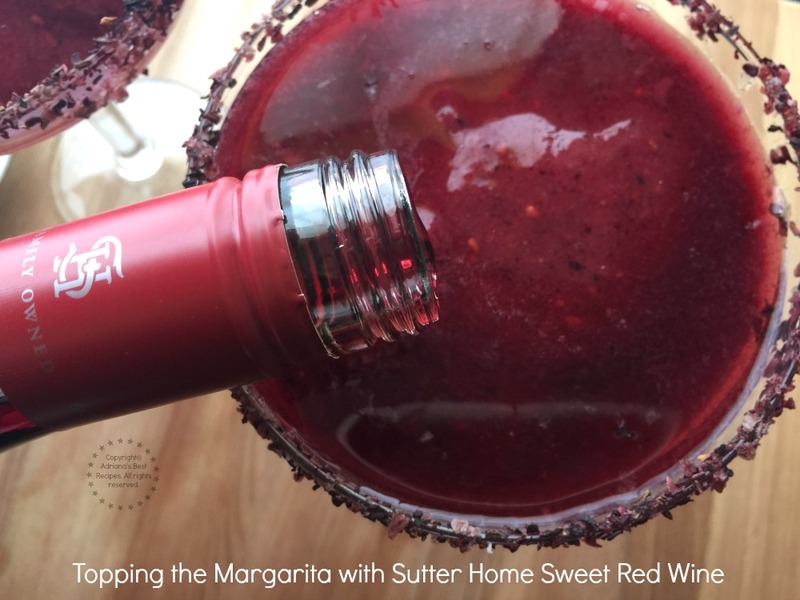 Finish the margarita pouring chilled Sutter Home Sweet Red wine. Garnish the margarita with a pinch of hibiscus salt, a lemon round and a cute decorative pin with blackberries inserted. I truly enjoy organizing girls night in parties for my girlfriends. We all are busy working moms and having the chance to stop for a moment and have fun, helps keeping up with the high demands of life. 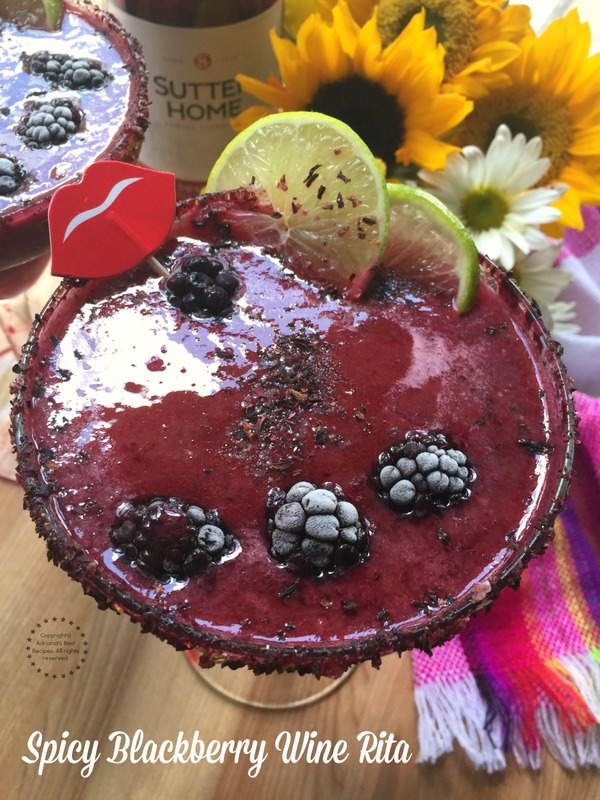 Organizing a party at home this summer is the way to go to get the chance for some “me” time while bonding with my friends, savoring delicious bites and sipping a margarita made with Sutter Home Sweet Red Wine. Watch the video and see how easy it is to make this refreshing margarita! There is nothing more Mexican than a cocktail margarita, tacos, guacamole and live music. Can’t wait for my girlfriends to arrive and get the party started. Making craft cocktails at home, like this Spicy Blackberry Wine Rita is a creative way to bring alive a classic margarita recipe with a twist. Creating artesanal cocktails it is very trendy now. And wine can be a great pairing to use for cocktails. It allows you to think outside the box to create a special adult drink to cheer with your close friends. 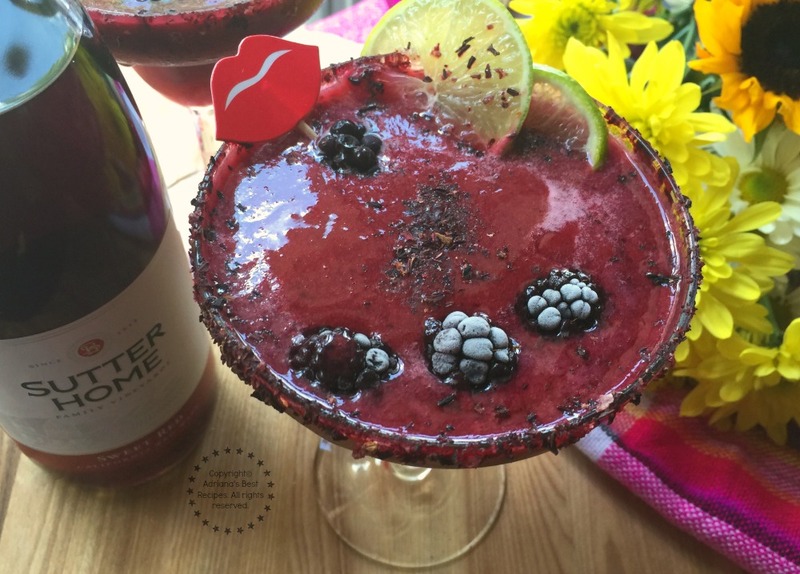 This Wine Rita is inspired in the classic margarita but with my special touch. I like Sutter Home wines because they have been in the market for more than sixty years. These wines are produced in California and have received over 350 medals. Aside from the fact that Sutter Home wines are affordable and deliver consistent product quality and superior value. 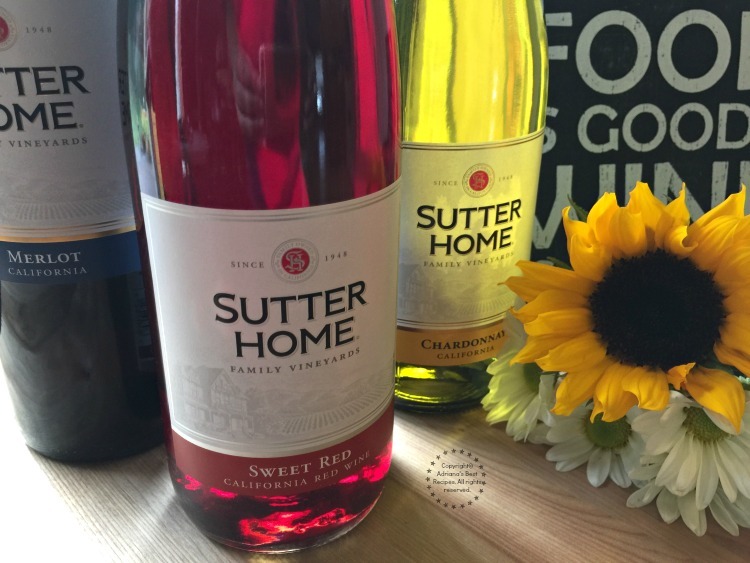 You can find Sutter Home wines nationwide and the varietals include: White Zinfandel, Chardonnay, Moscato, Pink Moscato, Pinot Grigio, Merlot, Cabernet Sauvignon, Sweet Red, Sauvignon Blanc, Red Moscato, Red Blend and Sangria. Something for every taste. There is no doubt that Sutter Home wines are the perfect choice for all my summer entertaining needs. Since they make everyday occassions more special. Because I can organize wine tastings with friends, prepare cocktails for girls night in, and pair the wide range of wine varietals with my favorite dishes no matter the cuisine. 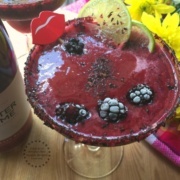 Cheers with this Spicy Blackberry Wine Rita, please enjoy with moderation and do not drink and drive. Visit UncorkTheMoments.com to learn more about Sutter Home wines. This looks delicious! Perfect for a girls night in!!! I love the combination of sweet and spicy with the blackberry and habanero. I’m saving this recipe for the next girls night in party! Cheers! You combined two of my favorite drinks and a whole bunch of my favorite flavors. Will you be my new best friend? Oh my goodness, this sounds wonderful and looks so pretty and fancy!! Yum! That sounds like an amazing cocktail. I can’t wait to make this. Wow! So many surprising ingredients in this beverage! Yummy! This looks soooo good! Ill be making this for sure this weekend. It looks like a really refreshing drink despite the spices! I love that you added frozen blackberries as well. This is perfect for a party! That is so beautiful, especially with the frozen berries within it. I can see how it would be a great addition to girls’ night in. I would like to invite my girlfriends in the house so we can try your recipe. Thanks for the nice idea! Oh my, that really looks very delectable. I’ve yet to try Sutter Home, this just simply makes me want to skip my recipe backlog and jump to this one for later’s dinner. What an amazing recipe, I love spicy and sweet combination! This cocktail is perfect for summer nights! Pinned it for the next party! It’s so beautiful, but more importantly I’ll bet it tastes utterly fantastic! I must slurp on one very soon! This looks very interesting…. Will the blender pulverize the blackberry seds enough so you don’t have to keep spitting them out? Oh sweet! I could drink 10 of those by myself! Saving the recipe for my next ladies night! That looks really dangerously tasty. I think I need to try this! In fact, I HAVE to try this at home. All your recipes are always sooooo great!! I need to try this! That looks really nice and refreshing. Since it has fruit in it should be considered a health drink, right? Oh my gosh YUM! This is right up my alley! Will be making it this weekend! Omg! This is very timely. I’m hosting a party tonight. I’m going to try this!! !